Question: Can you give me an MySQL Self Join Example? Question: What is DDL, DML and DCL ? Data Definition Language deals with database schemas and descriptions of how the data should reside in the database, therefore language statements like CREATE TABLE or ALTER TABLE belong to DDL. DML deals with data manipulation, and therefore includes most common SQL statements such SELECT, INSERT and Update etc. Question: How do you get the number of rows affected by query? SELECT COUNT (user_id) FROM users would only return the number of user_id’s. Question: If the value in the column is repeatable, how do you find out the unique values? Question: How do you return the a hundred books starting from 25th? SELECT book_title FROM books LIMIT 25, 100. The first number in LIMIT is the offset, the second is the number. Question: You wrote a search engine that should retrieve 10 results at a time, but at the same time you’d like to know how many rows there’re total. How do you display that to the user? SELECT SQL_CALC_FOUND_ROWS page_title FROM web_pages LIMIT 1,10; SELECT FOUND_ROWS(); The second query (not that COUNT() is never used) will tell you how many results there’re total, so you can display a phrase "Found 13,450,600 results, displaying 1-10". Note that FOUND_ROWS does not pay attention to the LIMITs you specified and always returns the total number of rows affected by query. Question: How would you write a query to select all teams that won either 2, 4, 6 or 8 games? Question: How would you select all the users, whose phone number is null? Question: What does this query mean: SELECT user_name, user_isp FROM users LEFT JOIN isps USING (user_id) ? Question: How do you find out which auto increment was assigned on the last insert? SELECT LAST_INSERT_ID() will return the last value assigned by the auto_increment function. Note that you don’t have to specify the table name. Question: What does –i-am-a-dummy flag to do when starting MySQL? Makes the MySQL engine refuse UPDATE and DELETE commands where the WHERE clause is not present. Question: When would you use ORDER BY in DELETE statement? When you’re not deleting by row ID. Such as in DELETE FROM questions ORDER BY timestamp LIMIT 1. This will delete the most recently posted question in the table questions. Question: How can you see all indexes defined for a table? Question: How would you change a column from VARCHAR(10) to VARCHAR(50)? ALTER TABLE questions CHANGE content CONTENT VARCHAR(50). Question: How would you delete a column? ALTER TABLE answers DROP answer_user_id. Question: How do I get the current time zone of MySQL? 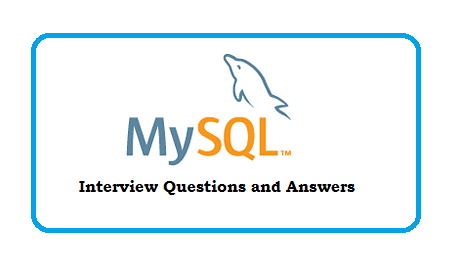 Advanced MySQL Interview Questions and Answers for Experienced.